BeauxBengals is a small, in home cattery located in Los Angeles, CA. 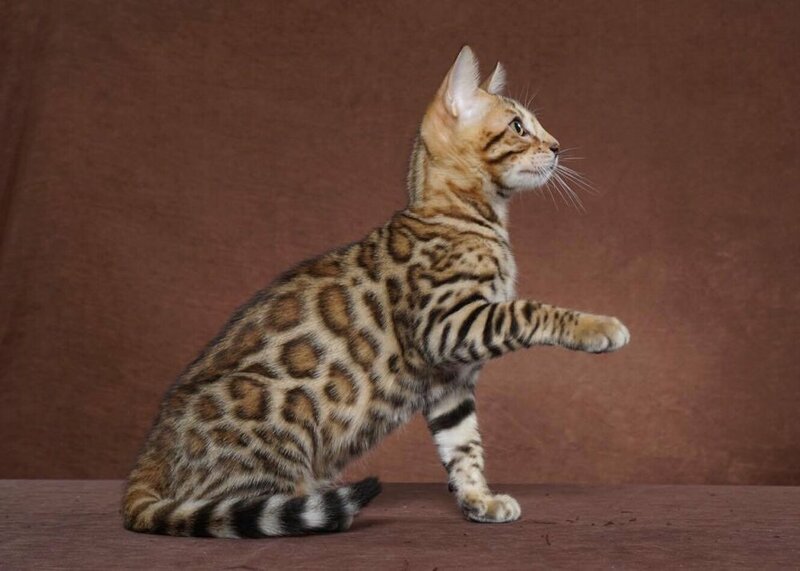 We breed beautiful brown rosetted bengals. We are lucky to have started with beautiful, healthy cats from great lines with stunning coats and loads of personality. If you're looking for a top of the line pet...check out what we have available! BoydsBengals Gaston of BeauxBengals & Mangosteen Fiona of BeauxBengals had beautiful litter of brown rosetted babies December 14, 2018. Photos of the babies coming soon. I started breeding bengals because I fell in love with the breed upon looking for a pet. Our breeders are cage free and treated as beloved pets. Thus, BeauxBengals will always be a small cattery with the philosophy that each kitten should be raised and loved as a family member. Above flash and beauty, we pride ourselves on providing not only a balanced biologically appropriate diet, but giving each kitten the love and attention, so they can become the cuddly lap cats we all want. This is why socialization, above all else is key. Our kittens are hand fed, snuggled hourly, and treated as the dear babies that they are. Food is medicine. Many of us, although we may have had cats as pets for most if not all of our lives, have failed to realize one very important thing about them – the fact that all cats are, by their very nature, born carnivores. Indeed cats are actually obligate carnivores, which essentially means that the nutrition they require to thrive must come from the meat, organs and bones of the bodies of other animals. And because of the cat’s particular anatomical and physiological design, the most ideal and natural way for them to consume that flesh and bone is in its raw state. This really does make very good sense once we stop to think about it. Because what other feline – much less any other carnivore in the world - ever consumes its prey cooked? The answer of course is that in Nature, this simply does not occur. Eating cooked food is not truly natural for cats, but eating raw food is! All carnivores, whether they be sharks, raptors, polar bears, foxes or wolves, are made to eat and digest the raw meat, bones and organs that make up the whole carcasses of their prey. And cats are certainly no different in this respect from any other carnivore. Feeding a carnivore a steady diet of anything that is cooked, canned, dried or ground is simply unnatural for that animal, and over time, doing so puts a strain on that animal's system. Such a chronic strain may often result in any number of the different kinds of health problems from which far too many present day domestic cats are suffering. By using Mother Nature’s way of feeding small wild cats as a guide, we humans may feed our domestic feline companions a diet that is most appropriate for the carnivores they are, while simultaneously affording them the myriad health benefits that a natural diet of whole foods can provide. It is fact that diet is the first step in keeping your cat in optimal health. FOOD IS MEDICINE! Even though bengals are a healthy breed, there are some things you need to make sure that you are aware of. Breeding cats should be tested for Progressive Retinal Atrophy (PRA), Hypertrophic Cardiomyopathy (HCM), and Erythrocyte Pyruvate Kinase Deficiency (PK Deficiency). These are the three leading hereditary conditions that you should ensure your breeder has tested for. Any reputable breeder who follows the TICA code of ethics will test for these conditions, or at least have proven tests of the parents of their breeding cats. Beyond health tests of the parents mentioned above, kittens need to be vaccinated twice for FVCRP: at 8 weeks and 11 weeks old. We start treating all kittens and mama cat for all parasites when the kittens reach about 6 weeks of age. Some parasites are very pesky and I am proud to say we use safe and effective homeopathic anti-parasitic treatments on our cats and steer clear of the harsh antibiotics and pharmaceuticals. Our kittens do not leave us until they are 11-12 weeks and have gotten the vet stamp of approval. For healthy and happy kittens, this time with mom is integral. We stand behind our cats and have a 2 year health guarantee written into our contract before the purchase. We screen homes for our babies. Just because you can afford a kitten doesn't mean you will get a BeauxBengals kitten. Only the best homes that are prepared to give our kittens the proper diet, love and care will be considered. Thanks for your interest in BeauxBengals!